Syrian army launches intensive aerial strikes on city of Nawa in southern Deraa province. The Syrian army late on Tuesday launched intensive aerial strikes on the city of Nawa in the southern Deraa province, Reuters reported. According to the report, dozens of civilian casualties were recorded as the army pressed a Russian-backed offensive in the area. A resident said that dozens of missiles were also fired on the heavily populated city that lies northwest of Deraa province near Quneitra province adjoining the Israeli side of the Golan Heights, where the army moved earlier this week to control the remaining parts of the country's southwest in rebel hands. 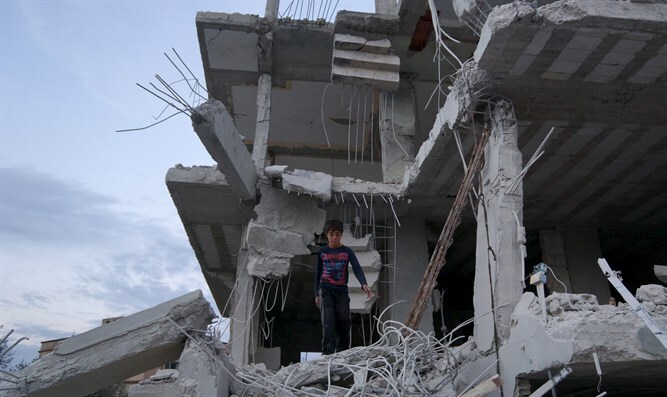 The city of Nawa, in which at least 100,000 people still live, is the largest urban center left in rebel hands in Deraa province where a Russian-backed offensive begun last month defeated rebels across a swathe of territory near Jordan and Israel. The artillery and aerial bombardment came only hours after thousands of displaced people who had taken shelter along the Israeli border returned to the city. They came back after reports that rebels had reached a surrender deal with the Russian military that would spare the city bombardment, another resident said, according to Reuters. Nawa has come under bombardment in the past. In 2014, dozens of missiles rained down on the city as part of ongoing attempts by regime forces to dislodge rebel fighters in the area.